It is that time of year again!!! 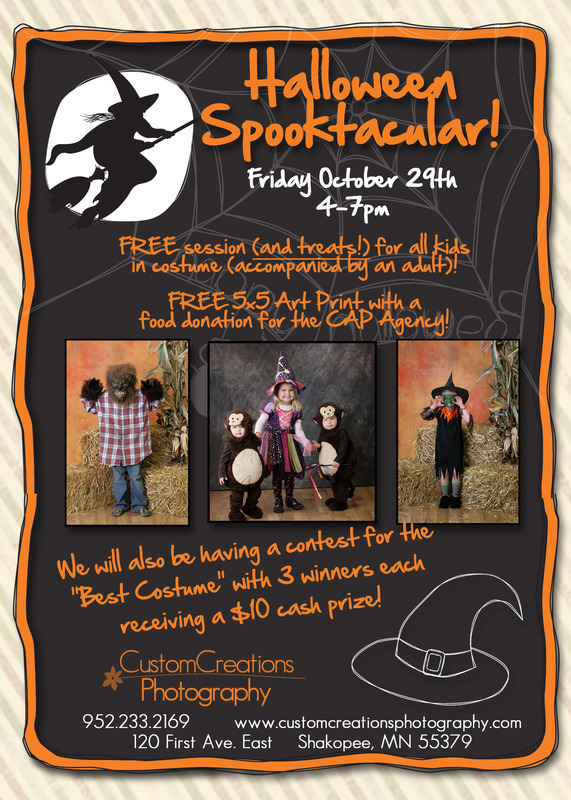 We will be photographing all of your little ghosts and gobblins on Friday, October 29th from 4-7p.m. No appointments neccessary!! All little gremlins will receive a FREE session (must be accompanied by an adult) and you will also receive a FREE 5×5 art print with a food donation for the CAP Agency!! (limit one free print per family!) Additional prints will also be available for purchase at reduced prices for this event!! And new this year we will be giving away a $10 cash prize to the top 3 costumes!!! We hope to see you there!! Posted in Uncategorized | Comments Off on Halloween Spooktacular!! !